Ingredients: Notopterygium root, duhuo angelica root , large gentian root , ledebouriella , tangkuei . Eliminating cold, resolving dampness. This tea is helpful for cold rheumatism with symptoms of cold pains of the joints. Ingredients: Astragalus root , tangkuei , ligusticum root , carthamus flower, red peony root . Ingredients: Plantago seed , knotgrass , dianthus , gardenia fruit , ligusticum root . Clearing heat, disinhibiting dampness. 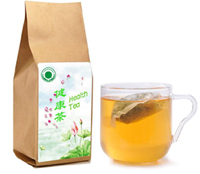 This tea is helpful for prostatitis with symptoms of burning prostate, urinary urgency, white discharge. Ingredients: Moneywort , lygodium spore , gizzard lining , achyranthes root, unripe bitter orange . Clearing heat, dissolving stones.This tea is helpful for stones in the kidneys, urinary tract, gall-bladder. Ingredients: Astragalus root , codonopsis root , flowery knotweed root , lycium berry , mulberry . Enriching vital energy, tonifying blood and kidneys. This tea is helpful for fatigue, too much sleeping, etc. Ingredients: Cooked rehmannia root , tangkuei , white peony root , flowery knotweed root , lycium berry . Tonifying blood. This tea is helpful for lack of blood with symptoms of dizziness, fatigue, pale complexion, too much sleeping, cold hands and legs, etc. Ingredients: Morinda root , epimedium , cuscuta seed , lycium berry , cistanche stem . Enriching the kidney yang fire. This tea is helpful for men’s poor sexual ability with symptoms of cold hands and legs in winter, preferring warm drinks, frequent night urination, etc. Ingredients: Lycium berry , mulberry , cornus fruit , dioscorea root , cooked rehmannia root . Enriching the kidney yin fluids. This tea is helpful for men’s poor sexual ability, weakness, tiredness with symptoms of dry mouth, night sweating, skinny body, etc. Ingredients: Fetid cassia seed, crataegus fruit , lotus leaf, typha pollen , gizzard lining . Reducing fat. This tea is helpful for reducing fat. Ingredients: Lycium berry , flowery knotweed root , mulberry , carthamus flower, ligusticum root . Enriching and quickening blood, tonifying kidneys. This tea could help girls and ladies have beautiful complexion.